Description: This lovely bride looked great walking down the aisle, standing with the bridesmaids, and standing beside her husband to be. Now she'll look beautiful dipped low and deeply kissed. Instructions: Use the mouse to click on and through the floating clothing, hair, accessory, and background options for this beautiful bride. 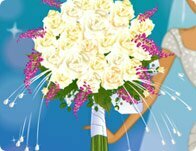 As a wedding florist, create a special bouquet to satisfy the floral need of this bride. Put together a blushing bridal gown and top it off with a one of a kind hair style for this special day!